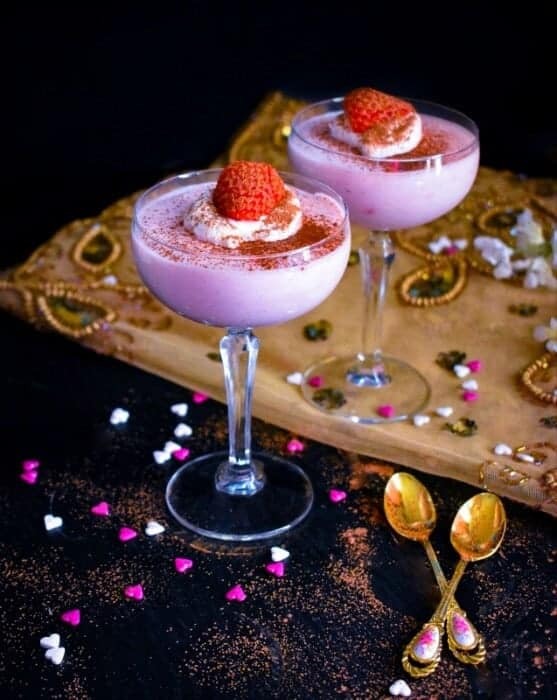 3 Ingredients Strawberry Mousse – Vegan Glutenfree Recipe: Creamy, light and an absolutely divine mousse made using strawberries and coconut. It’s perfect for a quick dessert anytime. 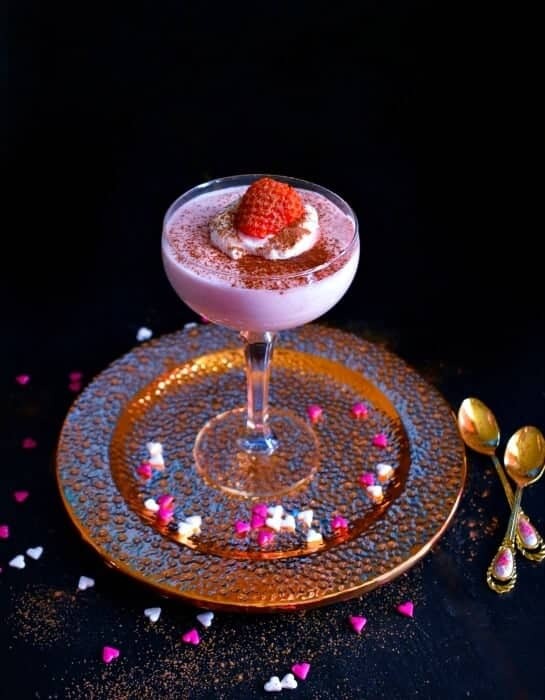 3 Ingredients Strawberry Mousse is a Perfect dessert for any gathering. 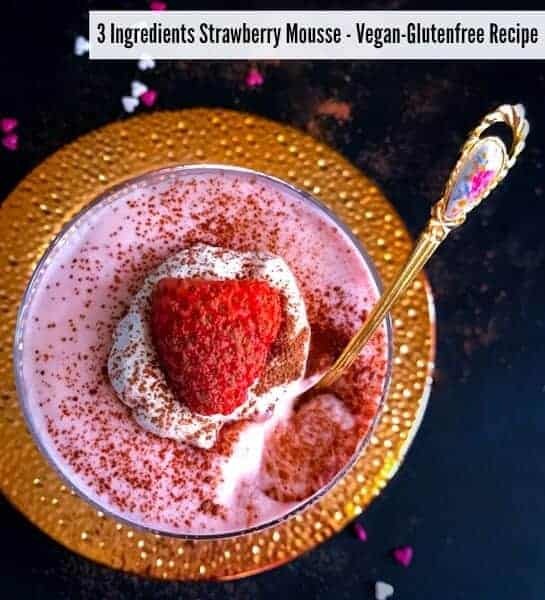 Hence, I had to share this 3 Ingredients Strawberry Mousse – Vegan Glutenfree Recipe that’s super quick and easy. I’ve made over n over n over again ……gosh, I’ve even lost count of how many times I’ve made it now. It seriously is my go-to dessert because it tastes yummy, looks gorgeous and has been the star recipe everytimeI’vet I’ve served it. And if you need any extra sweetness, you can add sugar or honey and that’s it. Whip all these 3 things together and you have yourself a gorgeous baby pink dessert that’s really hard to stop at just one. It’s so simple that it makes for a perfect takeaway dessert too for parties or any other gathering. 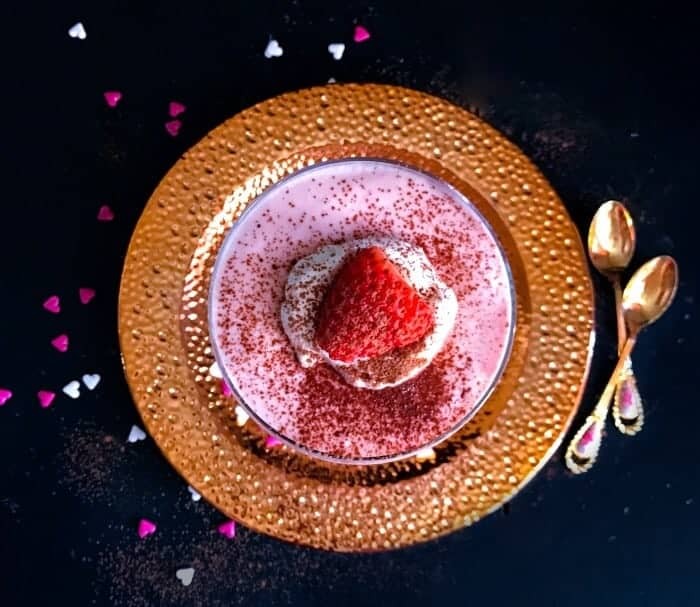 I’m especially making this 3 Ingredients Strawberry Mousse for Valentine’s as it goes with the soft pink theme which I really like and he loves light fruity dessert. 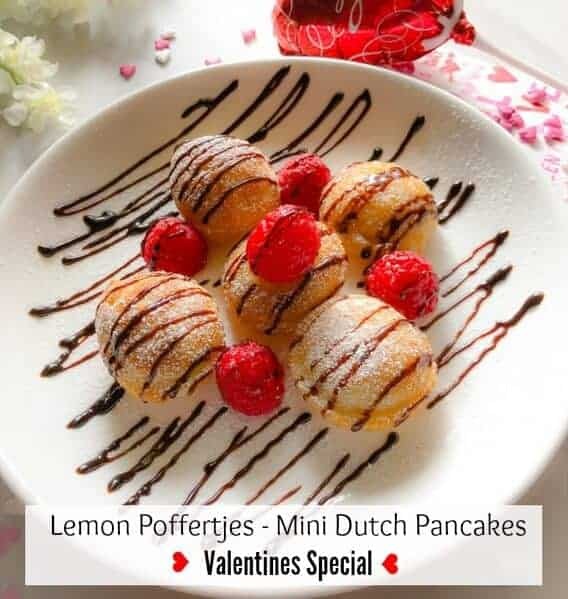 Also, I’ve recommended this to so many of my friends who are looking for last minute Valentine’s recipe but don’t wanna spend much time making it. To make this creamy mousse, all you have to do is place the can of coconut milk in the fridge overnight or even 2 days before and that’s the only prep you need. 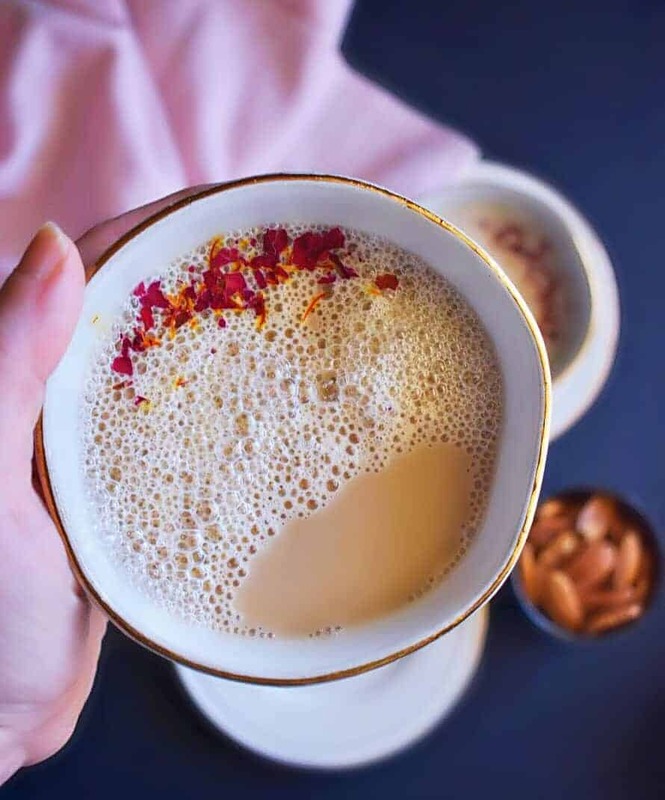 Just open and whip the milk into soft peak (gradually becomes creamy) and then mix strawberry int it. You can use the fresh / frozen strawberry pulp. If you don’t have strawberry, then use 3 tbsp strawberry jam for 1/2can of coconut milk. As always, I love when you try my recipes and tag me on social media using #easycookingwithmolly or comment on the posts. I read all your comments and look at all the tags and try my best to reply as soon as possible. 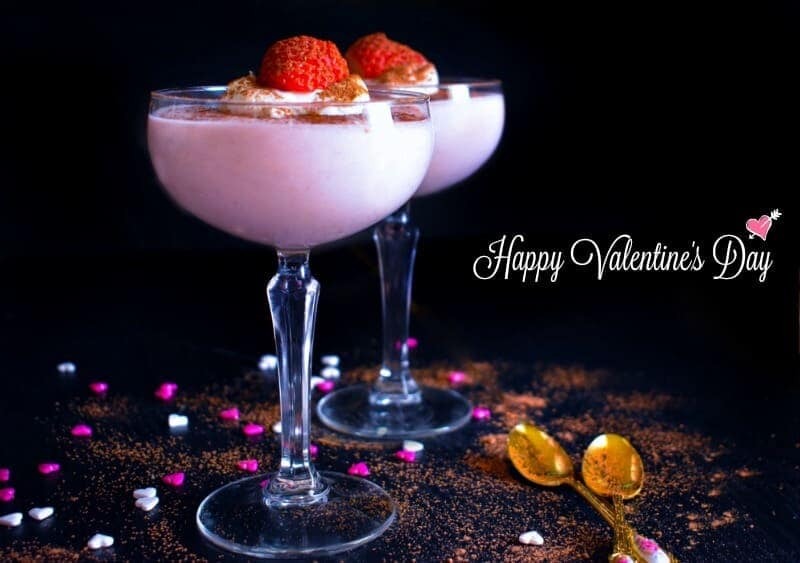 So, I hope you give this 3 Ingredients Strawberry Mousse a try this Valentine’s as it doesn’t get easier than this. 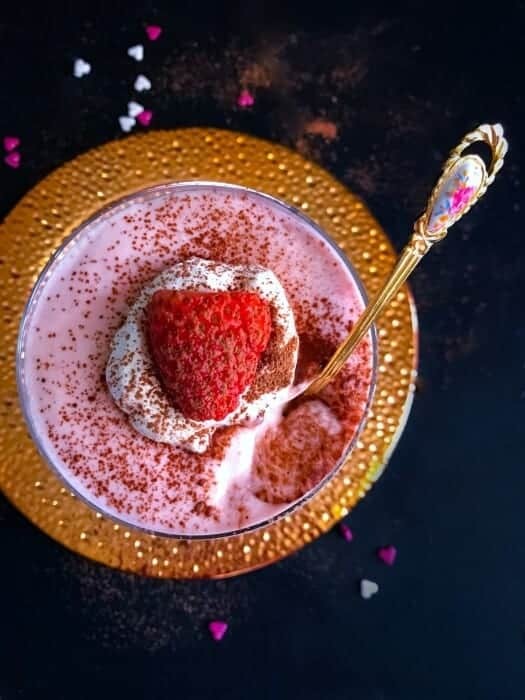 3 Ingredients Strawberry Mousse - Vegan Glutenfree Recipe: Creamy, light and an absolutely divine mousse made using strawberries and coconut. 4-5 Strawberries - I'm using fresh. 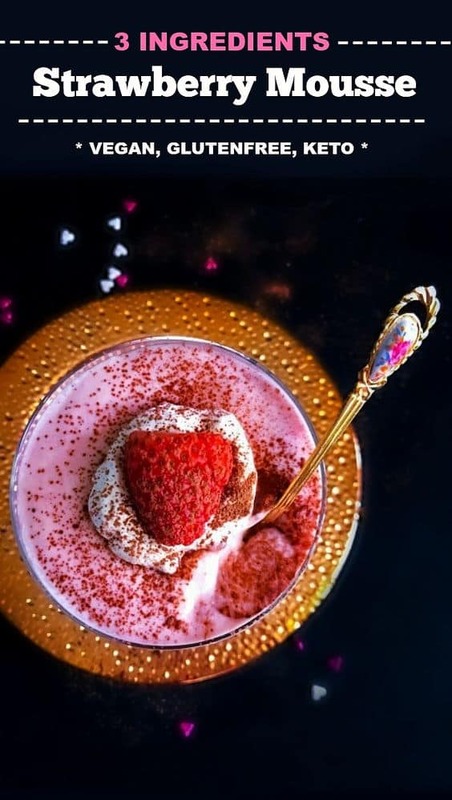 Place the strawberries in a blender and pulse to form a smooth mixture. Whip the coconut milk in a large bowl. Add the strawberry mix and whip again to mix evenly. Taste test the mixture and if need be, add sweetener of choice and mix well. Place the glasses in fridge for 10 minutes (for the mousse to set). Remove the mousse from the fridge, top with a dollop of coconut cream and place a strawberry slice on top. Dust with chocolate powder and serve immediately. This can stay in fridge for 3 days. 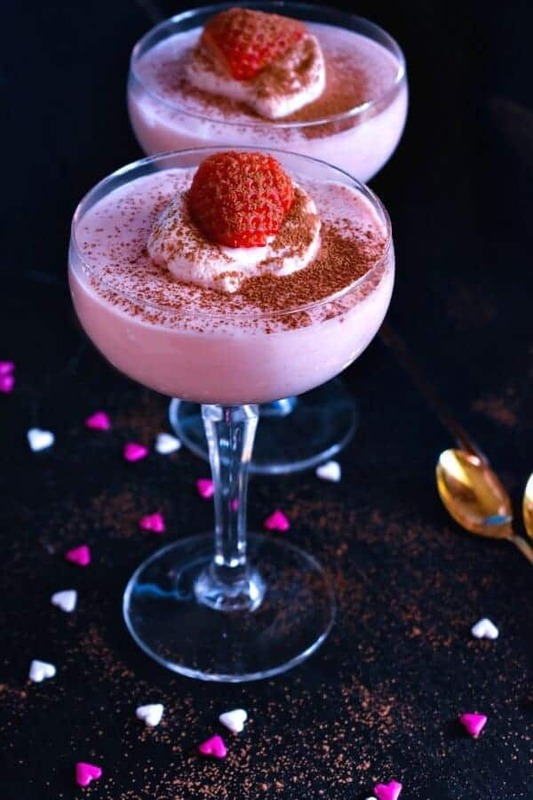 53 Replies to "3 Ingredients Strawberry Mousse - (V+GF)"
This looks delicious, and I love how easy it is! This looks so good! I have a bunch of strawberry plants that should provide a good harvest this year..I’ll add it to my list of recipes to try! I have to agree that making a dessert for your loved one does not get any easier or attractive than this one. Lovely recipe and great choice of ingredients. I love the coconut milk and fruits combination. This mousse couldn’t be any better, Molly! 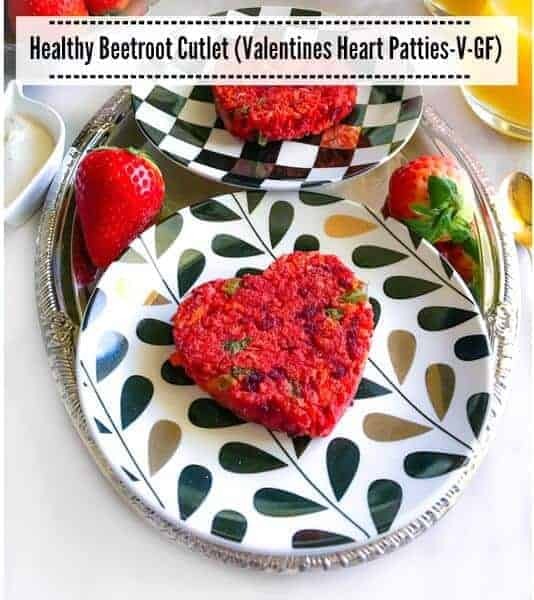 Thanks for the delicious, healthy and colorful recipe! Glad you liked it Agness. I love how simple this is to make – and such a beautiful color, too! Coconut milk is so good in desserts. Thanks Julie, glad you liked the the recipe.